Concerned about pollution, especially waste-water seepage, Clear Lake promoted a state investigation and survey at an expense of $15,000. 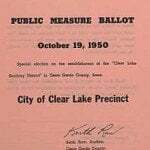 The investigation determined that Clear Lake was becoming polluted due to the rapidly increasing use of the lake parks and adjacent areas by thousands of people. A meeting by the Association for the Preservation of Clear Lake was held to discuss a proposed new sanitary sewer system for Clear Lake and the surrounding area. A public meeting was held at the high school auditorium to discuss the pollution concerns and proposed sanitary sewer with presentations by local and state officials. As reported by the Osage Press, there is a strong indication that the lake will be closed to swimming until the conditions resulting in serious water pollution can be remedied. Up until now, citizens were not convinced the problem was serious enough to warrant a new sanitary sewer. An earlier proposal was defeated, however, this time there seems to be no choice. The sanitary sewer election was approved with a margin of 926-265. The estimated cost would be $1,100,000 and petitions are circulated to establish trustees for a sanitary sewer district and apply for funding. Gov. William S. Beardsley signs a bill appropriating $700,00 to aid the sewage disposal plant. A bid totaling $1,429,059.76 is awarded to three companies including Henkel Construction of Mason City. Henkel Construction Company begins excavation and construction of the new sanitary sewer. 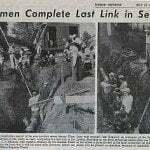 The final link is added to the pipeline, as the sanitary sewer is completed. 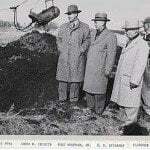 Members of the Clear Lake Sanitary District Board of Directors throw the switch and the new sanitary sewer begins operation. The plant has a design capacity of 24,000 persons for a 30-year period. The initial load was 5,500 persons from the area included within the Clear Lake Sanitary District. The load will gradually increase as more residences are constructed and connected year after year. There is more than twelve miles of main lines in the sewer. There are five pumping stations. Some of the main trunk line is thirty-two feet deep. Construction begins on estimated $4.4 million phase: lift stations 5 and 8, new force main pipe connecting to treatment plant, and equilization basin on 24th Street. June 20, 1998Downpour causes problems for pump stations 1, 2, & 3. Untimely torrential downpour of three inches per hour forces Sanitary Sewer District to bypass rain-diluted sewage into the lake instead of allowing residential backup in drains and basements. Directional drilling pipe installed under lake by Ozzie's Directional Drilling. 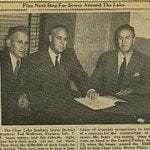 Board of Trustees sign a 25 year Service Agreement with Interstate Power and Light (IPL) to supply effluent to assist with the cooling water needs of the Emery Power Generating Station and to receive cooling water discharged back to the sanitary districtÕs treatment plant for direct discharge or treatment. The Clear Lake Sanitary District, City of Clear Lake, and City of Ventura entered into an agreement with WHKS to perform sump pump inspections for all properties connected to the sanitary sewer system. These inspections were to help reduce the amount of ground water getting into the sanitary sewer system. During storm events the sanitary sewer receives a large amount of storm water from illegal connections that consumes sewer capacity and can cause sewer overload resulting in basement backups or bypassing events. Many homeowners are unaware of illegal connections. The point is not to penalize consumers but to identify and disconnect sources of sewer overloads. Storm water should be conveyed through the watershed (lakes, creeks, rivers) via storm ‘sewer’ pipes and NOT sanitary sewer pipes. These are two distinct separate infrastructure pipe systems. Board of Trustees lowered sewer consumption rate from $2.53 per 1,000 gallons to $2.17 per 1,000 gallons. The sump pumping inspection program was completed by WHKS. An Ordinance was created, requiring a sump pump inspection for new construction and an inspection of properties at the time of sale. This Ordinance ensures that illegal connections will continued to be identified and remedied. The inspection will be conducted by the Clear Lake Sanitary District, City of Clear Lake, and City of Ventura.